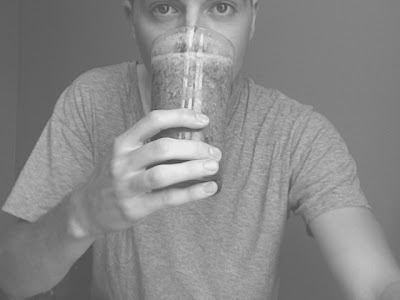 Here is a smoothie that I made out of heather gray cotton. This green smoothie is so, so, SO much better than the first one I had because it was so much more leafier. I felt like my stomach was frolicking and fiddling in a garden. I had 2 small cups of leftovers that I said I'd drink later, but totally threw them out this morning because I was tired of watching them grow thicker and thicker. I unexpectedly woke up this morning before 7:00am, by myself, with more energy than I usually would at not even 7 in the morning. I've been reading that this is also to be expected. You can go to bed later, wake up earlier, and still have a lot of energy than you would if you slept for 8 or 9 hours, so that's good. I got up again around 8 or 8:30 and began my day. I've been noticing a pattern so far in my days, concerning how I feel. I have my lemon and ginger water, then I do my Greens+ drink, and then for a couple hours after I have more energy, until I don't. I'm happy and singing and whatnot, and then later in the day I just get head achey and dizzy and more irritable. That usually kicks in around noon, when I eat again. The smoothies have been keeping me full until then, as well as the water, which is good. I'm wondering how much raw food I really should be eating. They say to eat whatever you like, however much you like, but it must be raw if you want the full detox experience, which I am doing. However, I haven't been able to go to the washroom fully yet, which I'm not sure is normal or not. So therefore, I feel like I'm eating all this good stuff, but it isn't being eliminated.. yet. I've only had 2 P&B shakes so I'm sure it takes a while. Some people, in time, end up taking 3-5 shakes or day, which I'm sure would cleanse you the hell right out. I'm scared to see what comes out of me, haha. I've been googling "mucoid plaque" to see what it will be. Google it yourself if you have the stomach. It's like alien sludge or something. Sorry if this is graphic or strange to read. Eeek. Today I'm going to meet my aunt at her place at 3:30 to talk about eating right for your blood type and the sort. She has the book, as well as tons of organic food, and other resources to offer that I'm excited to indulge in. She also knows a lot about water, milk, and to-do's and to-avoid's. She also knows of an organic food co-op in Waterdown (and also in Kingston, I believe) which gives out catalogues filled with organic food to buy, where people order from the company and pick up their items from a pick-up center (someone's house) in the given city, which I'm also excited to hear more about. I'm on the right track! PS. I dreamt I ate an entire thing of cookie dough and woke up thinking I actually did, which was, I won't lie, slightly traumatizing. An introduction to metaphysics from both classical and contemporary sources. The course considers such topics as space and time, motion and matter, and the nature of consciousness. An introduction to political philosophy which explores the relationship between state and citizen. Issues include: civil disobedience, nationalism, the welfare state, anarchism and the capitalist state. An introduction to ethics via an examination of controversial moral issues. Special topics: abortion; animal rights; euthanasia. The relationship between philosophical traditions and medical theory will be explored, as will the impact on philosophy of medical discoveries (such as anaesthesia and antibiotics) and diseases (such as the Black Death and AIDS). Emphasis is on concepts of disease from antiquity to the present. Drawing from a number of sources and philosophical traditions, this course will explore the concept of peace, obstacles to peace, ideas that promote peace, the moral dimensions of peace, philosophies of nonviolence, pacifism, and attempts to envision a peaceful world. An examination of whether life has 'meaning', and a consideration of different philosophical interpretations of the meaning of life, the significance of death for the meaning of life, and whether it even makes sense to speak of life as having meaning. An examination of key issues and texts in the philosophy of education. Possible topics include the nature and aims of the learning process, progressive and conservative education, the politics of education, and contemporary debates regarding the canon. An examination of the development of central debates in epistemology and metaphysics from the early modern period to the present. Focusing on the work of thinkers like Descartes, Kant, Wittgenstein and Quine, such questions as the nature and justification of knowledge, mind and body, personhood and community, truth and meaning will be discussed. A discussion of some ontological and epistemological problems associated with mathematics. An introduction to environmental philosophy through a study of readings that have exercised a formative influence on Western thinking about the relationship between humans and the rest of nature, and hence also about human nature itself. The course will offer an environmental perspective on the history of philosophy from ancient to recent times. I'm so excited that I found something I'm so excited about.